Denmark is one of Europe's finest countries with a rich heritage and stunning scenery. Home to the Vikings, the Scandinavian nation is famed for its architecture as well as its history with many buildings being constructed from blonde wood and metal. Denmark is a fine destination in itself, but its location in the south of Scandinavia means travelers can easily pass into neighboring Germany by road or take a ferry to Sweden and Norway as well as providing a good link by sea to Iceland and the Faroe Islands. Denmark is made up a number of islands and although bridges and tunnels have been built, getting around the country by ferry is still convenient and enjoyable. 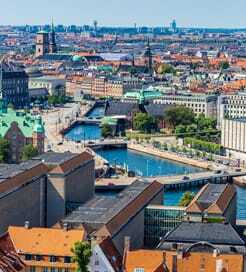 Copenhagen is located on the east coast of Denmark's largest island, Zealand. A large bridge and tunnel connect the city to Malmo in Sweden, but you can also cross the sea by ferry. Helsingor, just up the coast from Copenhagen, has numerous daily crossings to Helsingborg. Domestic services also run each day connecting you with Als, Samsø, Bornholm and Langeland. While the main Danish peninsula of Jutland shares a land border with Germany, it is far easier to take a ferry if travelling from the east of Germany to one of Denmark's islands. Currently, ferries operate daily between Rostock in Mecklenburg-Vorpommern and Gedser on the southern tip of Sjaelland as well as Puttgarden and Rodby. 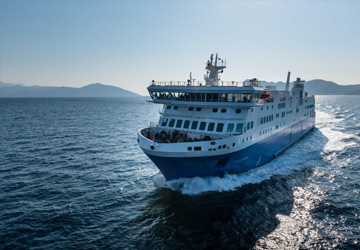 Ferries connecting England with Denmark ceased at the end of 2014 having has been in operation for nearly 140 years. Copenhagen is the main tourist destination in the country. It's most visited attraction is the Tivoli Gardens, a large amusement park that has been open since 1843 and is packed with thrill rides as well as a theater and stunning exhibition halls. The Copenhagen Zoo is also much loved and is home to animals from all seven continents, including African lions, polar bears and elephants. Billund in Jutland is home to the original Legoland as well as the first factory of the famous toy brand. The park has been open since the late 1960s and attracts more than 1.9 million visitors each year. It has more than 40 rides including four roller coasters and a popular area known as Mini Land that features models of landscapes, cities and buildings made entirely out of Lego bricks. Other popular sights and landmarks include the Lalandia Billund AquaDome and the Little Mermaid sculpture at the Langelinie promenade in Copenhagen. For more information, please visit our Ferries from Germany to Denmark page.